Creation Worldview Ministries: Paleomagnetism Busted! This short review of the Ham - Nye Debate was first posted in the Science Against Evolution newsletter, February, 2014. While this review was written by Dr. R. David Pogge and he is responsible for the content, we agree with his review. This essay was first posted in the Science Against Evolution newsletter, December, 2013. The essay was written by Dr. R. David Pogge. This months essay has three goals. To disprove the myth that the residual magnetism of rocks can be used to determine the age of rock formations (and therefore date fossils). To emphasize the difference between science and philosophy. To present a simple science fair project which better explains the discovery of alternating bands of magnetic polarization in geological formations than the orthodox myth. Before we disprove the myth, we have to tell you what the myth is. Many scientists believe that residual magnetism can be used to determine when igneous rocks cooled. Here is the beginning of a typical science worksheet. The worksheet then provides figures below showing the alleged times (white bands) when the Earths magnetic field was reversed. 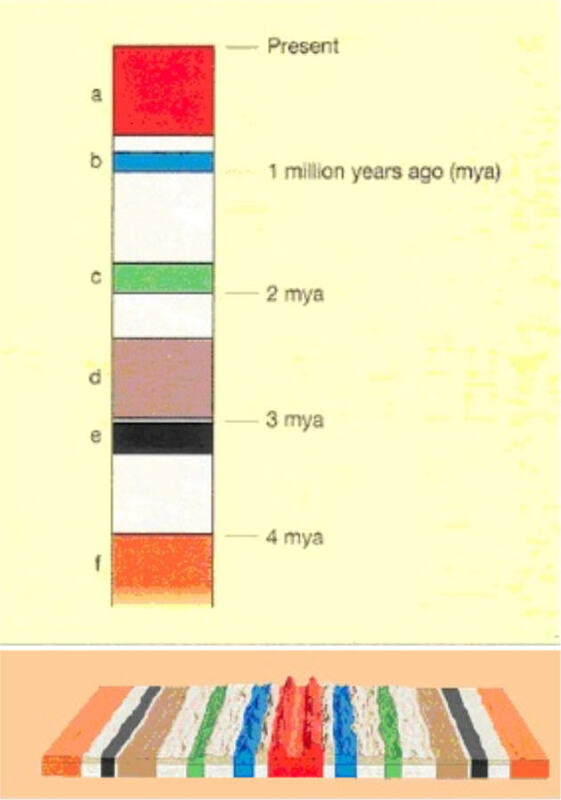 This particular worksheet addresses plate tectonics (that is, how long it took for continental plates to move into their current position) and doesnt say anything about fossils; but paleomagnetism has also been used for dating fossils (including Skull 5, which was described in last months newsletter 3, which is what prompted this essay). Scientists measure the magnetic orientation of rocks above and below a fossil. The fossil must have been buried after the lower layer was deposited, and before the upper layer formed. If one knows the times when the two layers were formed, one can tell the age of the fossil. But if the ages of the bounding layers are wrong, then the age of the fossil is wrong. We will show experimentally that one cannot use residual magnetism as a clock. That is, the residual magnetism cannot tell how long it took for continental plates to move, nor can it be used to tell the time between the deposition of rock layers above and below a fossil. Lets separate the science from the philosophy, facts from speculation. The first step in the scientific method is observation. It is a scientific fact that parallel alternating bands of magnetic polarization have been discovered under the Atlantic Ocean and other places. Granted, the magnetism is so weak that it takes special equipment to measure it, and scientists must be very careful to mark the orientation of the rock samples before they are removed from the ground and taken to the laboratory. There certainly is the possibility of errors introduced through carelessness and mishandling; but that isnt our argument. The discovery of these magnetic bands has been verified independently by a number of different scientists, so we can be assured that the phenomenon is real. Thats the strength of the scientific method. Observations can be verified by a number of different people using independent methods. 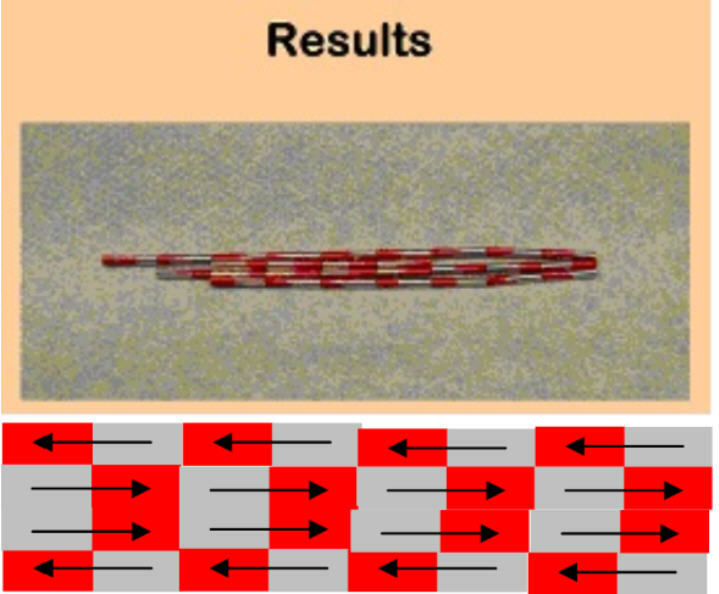 We can be confident that alternating bands of weak magnet polarity do actually exist in nature. The second step in the scientific method is to propose a hypothesis as to WHY we observe what we have observed. The conventional hypothesis, accepted as fact by the worksheet quoted above, is that igneous rocks have been forming for millions of years. When the rocks are liquid, magnetically polarized minerals line up with the Earths magnetic field, and they retain that orientation when they solidify. Furthermore, the hypothesis says, the Earths magnetic field reverses direction every million years or so. That is, a million years ago, a compass would have pointed to Antarctica rather than the current position of the North Pole. The third step is to devise an experiment to determine if this happens or not. To our knowledge, we are the first to do this. The fourth step is for others to repeat the experiment and verify it. Thats where you come in. When it comes to paleomagnetism, the scientific process came to an end with the hypothesis. The "proof" came from the realm of philosophy. Some scientists thought the hypothesis was reasonable enough that it must be true without the need for experimental verification. What could possibly cause the Earths magnetic field to reverse spontaneously? An in-depth discussion of second-order differential equations is beyond the scope of this essay. Suffice it to say that second-order systems (that is, things that oscillate back and forth) are well understood by engineers and physicists. Reversals in the Earths magnetic field dont make any sense from a scientific point of view. In every oscillating system known to science, energy transfers back and forth between two states. For example, a weight at the end of a string is pulled to the left, giving it some potential energy. When it is released, the weight swings down, increasing in velocity until the pendulum is at its lowest point. All the potential energy (energy of height) has been converted to kinetic energy (energy of motion). Momentum keeps the weight moving to the right until it stops. All the kinetic energy has been converted to potential energy. The weight swings back to the left, converting potential energy back into kinetic energy. The pendulum swings back and forth as energy changes between potential energy and kinetic energy until all the energy has been dissipated by friction. The more friction, the greater the damping, and the sooner the oscillations die out. In electrical systems, a tuned circuit oscillates when electrons are stored in a capacitor. The capacitor discharges through a coil creating a magnetic field. As the energy stored as an electric field in the capacitor decreases, the energy stored in the magnetic field of the coil increases. Energy alternates between the electric field of the capacitor and the magnetic field of the coil. The polarities of the electric and magnetic fields keep switching back and forth until all the energy has been dissipated by resistance. If the Earths magnetic field really is oscillating, changing polarity (direction) every million years or so, the energy in the magnetic field has to be transferred to another energy storage state, which then discharges energy back creating a reversed magnetic field. What is that other storage state? There isnt any. Therefore, the Earths magnetic field will naturally decay exponentially to nothing, but it wont change direction. We feel that the philosophical arguments against periodic reversals in the Earths magnetic field are far stronger than the generally accepted consensusbut we dont want to argue philosophy. We want to use the scientific method to figure out what really happens. 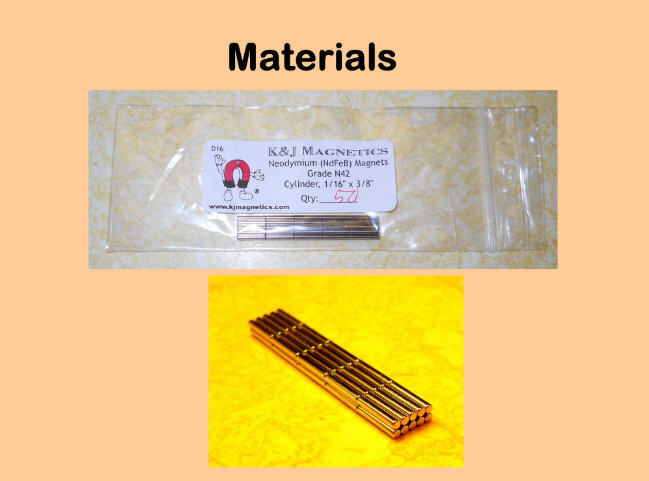 We bought 50 small axially magnetized cylindrical magnets for $13 (plus $5 shipping) from K & J Magnetics, Inc. They came stuck together in parallel rows. Unfortunately, they were not marked as to which end was the North Pole. We could not tell if all the North Poles were pointing the same direction. So, marking them was the first order of business. We cut a small piece off a sponge and let it float in dish of water. One at a time, we placed the small magnets (with random orientations) on the sponge. The sponge and magnet combination always aligned itself with the Earths magnetic field. This experimentally confirmed the fact that, when free to rotate, a magnet will rotate so that it aligns with the Earths magnetic field (confirming part of the hypothesis). After placing each magnet on the sponge, we applied a little bit of red fingernail polish to the end of the magnet that pointed north so we could tell the North Pole from the South Pole of that magnet. We placed two magazines side by side, with a 1-inch gap between them on the dining room table. Then we placed a paper towel on top of the magazines, letting it sag slightly in the gap between the magazines. (This was just to keep the magnets from rolling off the table.) When we dropped a single cylindrical magnet onto the paper towel it rolled downhill into the valley between the magazines and stopped there. Why did that happen? Because of gravity. The greater the distance between an object and the center of the Earth, the greater its potential energy. Things naturally roll downhill because they naturally seek the lowest possible energy state. It has to do with the Second Law of Thermodynamics. Energy likes to even itself out. If you put ice cubes in a glass of warm water, the ice gets warmer and melts, and the water gets colder, until all the ice has melted and everything is the same temperature. A glass of room-temperature water doesnt naturally separate itself into hot water and ice cubes. A glass with hot water and ice in it is more ordered (from an energy perspective) than a glass of water where all the molecules are the same temperature. The Second Law of Thermodynamics says that (in the absence of external influences) the ordered situation of hot water and ice will change to the disordered state of uniformly warm water. For the same reason, if you stir up a glass of water, causing waves to form, the surface of the water will naturally even out if you leave it alone. A glass of still water wont suddenly flow such that the water level in the left half is higher than the level in the right half for no reason at all. Energy does not remain separated into high and low energy states if it can help it. Thats why temperature tends to equalize, and water levels tend to equalize, and things tend to roll downhill. We dropped a second magnet onto the paper towel, close to the first magnet. It rolled downhill and stuck to the first magnet end-to-end, with both North Poles pointing the same direction. Why did that happen? It is basically the same reason why they rolled downhill. The greater the distance between two magnets, the greater the potential energy. The magnetic force pulls them together the same way gravity pulls everything down, to expend the energy. Magnets naturally seek the lowest energy state. The only difference between gravity and magnetism is that the magnetic forces are polarized. That is, a North Pole attracts South Poles, but repels other North Poles. Gravity attracts everything with mass. We dropped more magnets onto the towel, one at a time. They rolled together forming anti-parallel bands (just like bands of magnetically polarized rocks on the sea floor) in the crease of the paper towel. Why did that happen? The Earths magnetic field did not change direction several times in the few minutes it took do the experiment. The Earths magnetic field is strong enough to make a magnet floating on a sponge rotate to align with it, but it is too weak to have anything to do with how a magnet aligns if there are other magnets (or even unmagnetized iron) nearby. Just to prove the Earths magnetic field had nothing to do with it, we repeated the experiment with the crease in the paper towel aligned East/West rather than North/South. It did not change the results. Magnets naturally line up with the same orientation end-to-end and with opposite orientation side-by-side because thats the lowest energy state. In our experiments, it didnt matter if we aligned the depression in the paper towel North/South, East/West, or any other direction. The Earths magnetic field had nothing to do with it. There is no reason to believe that magnets in nature behave any differently than magnets on our kitchen table. Faced with the experimental proof that the orientation of residual magnetism is determined by a well-established physical principle (specifically, the Second Law of Thermodynamics, which says things naturally try to minimize energy differences), and has nothing to do with time, the myth that paleomagnetism can be used to determine when anything happened in the past is BUSTED.